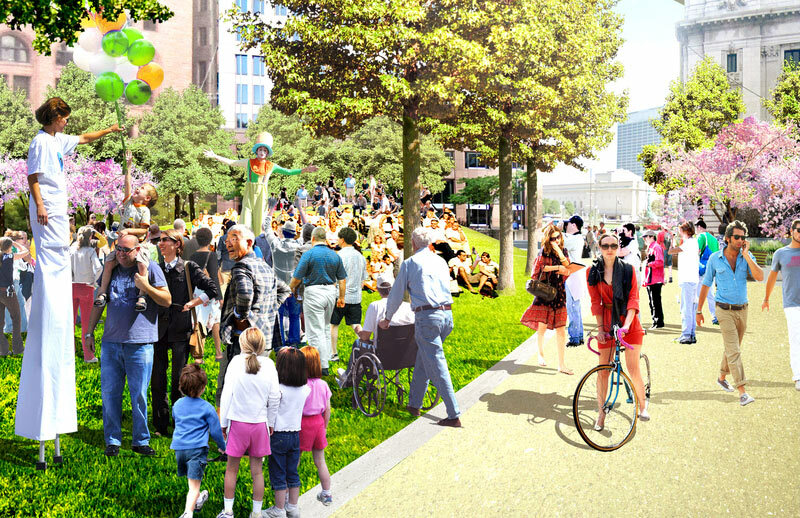 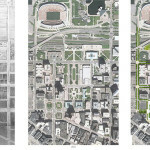 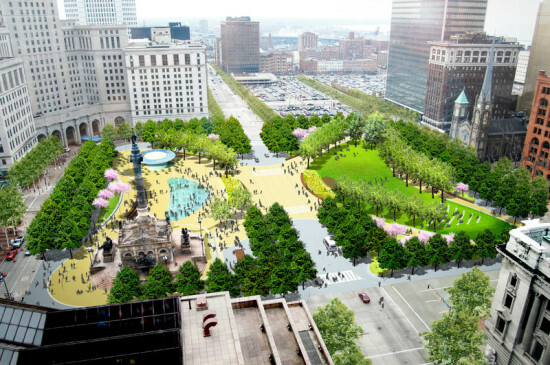 Cleveland last year unveiled a plan to revamp Public Square—a space that, as its name suggests, is meant to serve as a civic space for the city’s downtown. 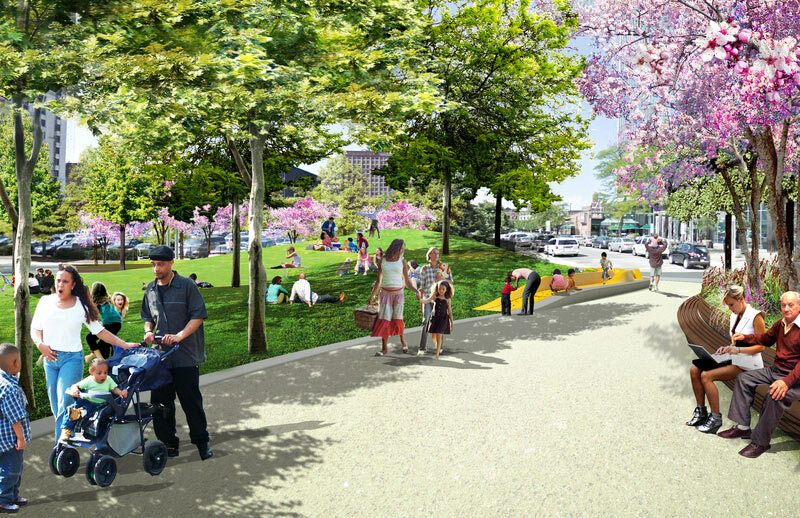 Now an $8 million grant could make that ambitious project shovel-ready by the end of this year. 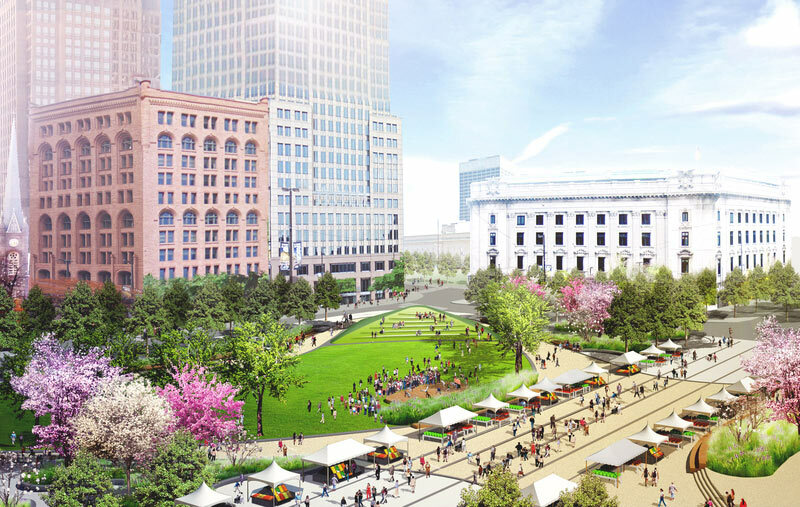 Superior Street will only be open to buses. 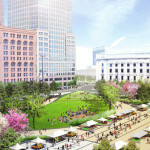 The Cleveland Foundation announced its donation Tuesday, gifting $7 million outright and withholding $1 million until Cleveland’s Group Plan Commission can raise an additional $7 million from nongovernmental sources by Halloween. 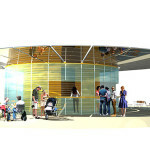 That would bring the total amount raised to $15 million, or half of the $30 million needed. 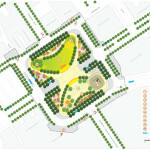 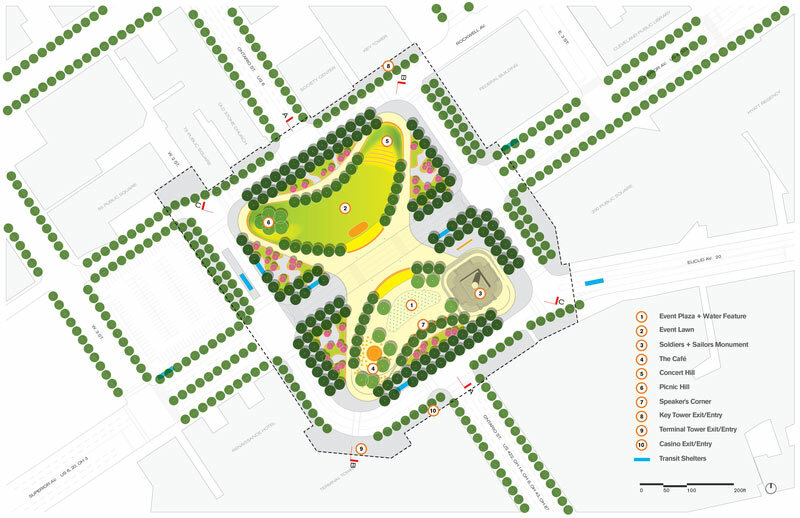 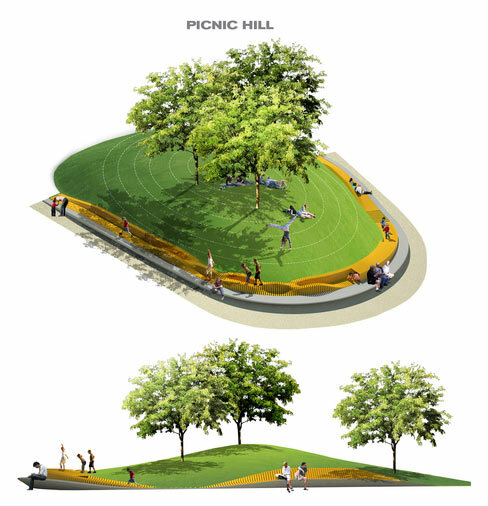 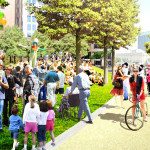 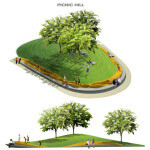 The design, courtesy of New York’s James Corner Field Operations and locally-based LAND Studio, knits four fragmented quadrants of public space together into one 10-acre park with spaces for art, ice-skating, and picnicking. 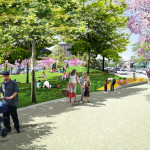 That would require the city to close a two-block stretch of Ontario Street, and restrict a section of Superior Avenue to bus traffic only. 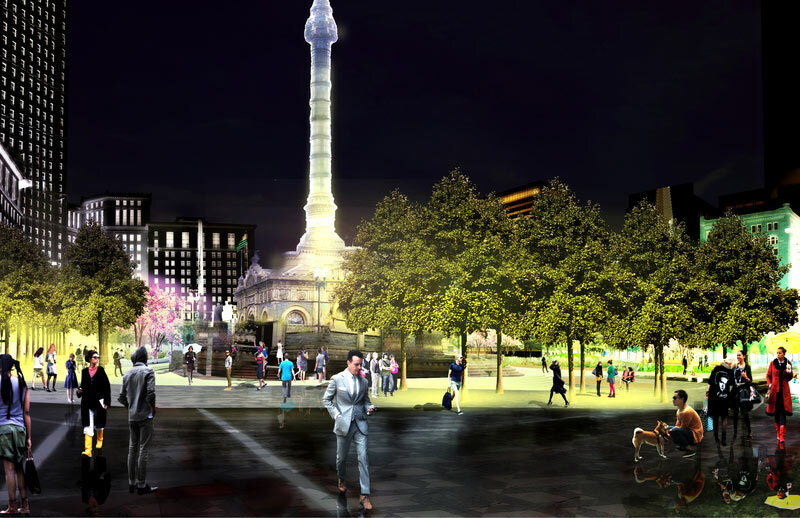 As the Cleveland Plain Dealer’s Steven Litt reported, the foundation formally announced the gift by a bronze statue of Moses Cleaveland, the city’s founder, who planned the downtown area with Public Square at its center in 1796. 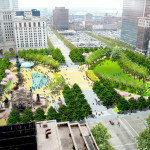 If enough money comes through in time to break ground later this year, the goal is to complete work by the spring of 2016, ahead of the Republican National Committee convention in Cleveland that summer. 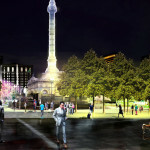 An existing monument, lit at night.